Orthopedic technology is indeed a craft. Yet many innovations in previous decades have led to an increased use of standardized parts. The Munich startup Mecuris, a spin-off of the University Hospital of LMU, would like to take a different approach: with assistance from a cloud-based platform, physicians and orthopedic technicians should be able to create prostheses and orthoses that put the focus back on one aspect: the individuality of every single patient. Orthopedic devices in just six simple steps, a significantly shortened production time and a 100% individualized fit – with this approach, Mecuris plans to change the orthotics and prosthetics market. It is a market with potential for growth, with a turnover that has doubled in the last 20 years to more than 1.8 billion euros in 2015 in Germany alone. Experts explain such growth based on demographic change and diseases of affluence, such as diabetes. These prospects also convinced High-Tech Gründerfonds and Bayern Kapital: In a seed-financing round, Mecuris received a high six-figure sum from the two well-known investors at the end of last year. Prosthetics made easy: how does it work? With the cloud-based solution by Mecuris, construction data about the orthopedic aid to be constructed is adapted to the anatomy of the patient with assistance from artificial intelligence and medical image processing techniques. An important factor is that physicians and orthopedic technicians do not require any special knowledge about CAD construction or 3D printing. Instead, they load the digital patient images — CT, scan or photos — into the configuration tool, which gives the Mecuris software the data it needs to create 3D images of the patient’s anatomy. The 3D images can then be individualized with help from a Mecuris technician to meet the customer’s needs. This is where personal wishes play a role. Factors are considered such as whether the orthopedic device should look modern or natural, or whether its wearer is athletic or more on the relaxed side. Now ready for printing, the 3D design is sent to a certified 3D printing center located near the customer – and is then created! CE conformity requires three major steps: first, comprehensive technical documentation is compiled. This is then followed by a clinical evaluation. Lastly, leg and foot prostheses have to pass a mechanical permanent load test and a maximum load test. The results: Mecuris is the first and currently the only company worldwide that was able to pass the testing cycle with 3D printed prostheses according to the standard DIN EN ISO 10328:2016 and now carries a CE conformity certificate. 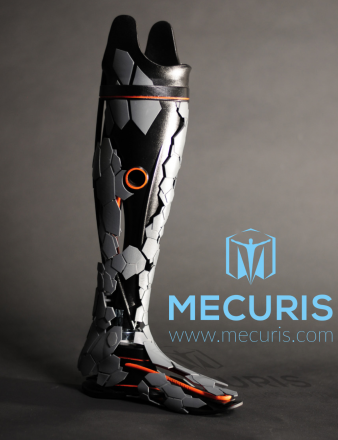 The designer prosthesis “Pangolin” (© Mecuris). A series A financing round is planned for the end of 2017. In addition, they plan to strengthen their employee base, particularly in sales. Manuel let us know they would be more than happy to have a working student in marketing.